Its 4 am and one can barely see the first few sunrays at Veltoor, a village 3 hours from Hyderabad, here a crew of hard hats and fluorescent safety jackets wearing men are busy cleaning solar modules at a 600 acre solar power plant. They have 2 more hours before the plant starts generating and they would then need to focus on operating it. Amongst the long advanced mops used for cleaning, their tools surprisingly consists of an android phone app with an electric Blue logo that guides them to tables of modules that have performed lower and require cleaning - one of many ways in which Prescinto is transforming how renewable energy plants are run. Industrial Internet of Things is a buzzword in almost every sector nowadays. The number of connected devices is increasing from 2 billion in 2006 to 200 billion by 2020 and as a result we are generating more data in a year today than past 5000 years of humanity. These devices and data are a huge challenge for any organization - from data security to updates, from integrating different devices to their management. This exactly is also the largest untapped opportunity to increase equipment and operational efficiency while reducing costs and overheads. Based out of Ahmedabad and Mumbai, Prescinto is building cutting edge platform to seamlessly integrate data from different brands of devices each communicating in their own distinct ways. 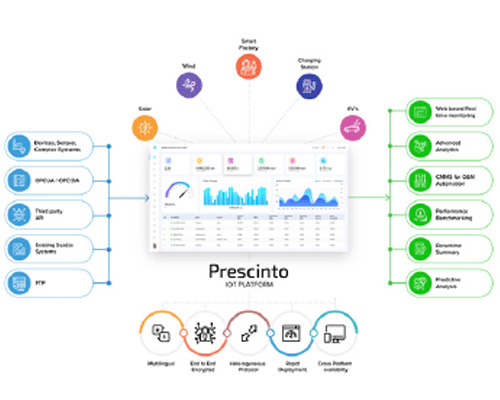 Prescinto acquires data from remote devices, presents it in neat customizable dashboards and analyses it to give actionable insights. While Prescinto is hardware and sector agnostic, it has already made its presence felt in renewable energy industry where in 2 short years of its founding, it has integrated data from 4,000 MW of solar projects across 13 countries. "Prescinto is building cutting edge platform to seamlessly integrate data from different brands of devices each communicating in their own distinct ways"
What is unique about Prescinto? While India’s renewable energy sector was growing at a feverish pace, Prescinto was in stealth mode for more than a year after incorporation, focussed on building the backbone architecture to power IIoT devices. In the following 6 months, the team concentrated on rolling out its first application on the platform for Solar Power Plants. Built from ground up, Prescinto today is arguably the most advanced monitoring and maintenance platform in the solar industry. With 250 milliseconds granularity, it is 1000 times more accurate than its industry peers which in turn enables it to capture micro-faults that are ignored but lead to long term deterioration of plant performance. It is amongst the first platforms that completely empower users - from the CEO at his corner office to the technicians on ground - to customize dashboards, reports and analytics in the ways that makes most sense for their roles. Further, it is the only platform that automates Operation & Maintenance activities on site based on assets and teams deployed, thereby eliminating the requirement of having separate ERP systems, paper based check lists and often ignored duty rosters. Prescinto will soon integrate with SAP and other enterprise software to seamlessly become a part of the organization digital transformation. Prescinto also boasts to be the first platform to provide all of the above and more on site - even without the internet connection - and on cloud over a browser or one of its windows, mac or mobile apps at the client’s offices. updates instead of manual hard coding at sites and more importantly, is enabled with edge analytics to provide instant feedback at the site without having to push the data to the cloud first. This is a game changer, particularly in India, where data connectivity in remote locations can be patchy. In the end, all of this leads to a higher uptime of equipment, a reduction in manpower required to manage assets and better returns for the projects. Renewable Energy - particularly solar - has been making rapid strides in terms of highest MWs installed and fastest drop in prices. Equipped with multiple data generating devices from inverters to weather stations to energy meters, the sector lends itself to maximum disruption by use of an intelligent IIoT Platform. Prescinto claims that with its complete suite of services including fleet management, real time monitoring, performance benchmarking, downtime analysis and O&M automation, the plants should have 1.5 percent higher uptime and 30 percent lower operational cost on an average. Further, with the layer of machine learning that Prescinto is building, it will be able to suggest ways to increase generation, predict faults and forecast spare requirements increasing the returns of the project by 10 percent. As an example, while the industry average of number of MWs managed by a site engineer in India is 6 at best, the plants that Prescinto powers has one engineer for every 15 MWs. These results are being seen in plants as large as 750 MWs in Mexico and as old as the ones commissioned in 2003 in Europe. Prescinto backed by Gensol Group’s engineering experience across 20,000 MWs of renewable energy projects, is able to transform that knowledge into code and empowers every plant that is on-boarded on its platform. Prescinto management team brings a diverse experience from various domains with expertise in solar energy, wind energy, consulting, O&M automation and manufacturing. Prescinto is built by professional team of 200 years of collective IIoT domain experience with deep sectoral expertise of its founders. With its dedicated teams for tech support and account management in addition to the data scientists, cloud & server backend, client user experience and firmware development, Prescinto claims to have one of the most aggressive Service Level Objectives and user friendly warranties for its clients. “At Prescinto, we are on an exponential growth curve adding a new plant to the portfolio almost every day. 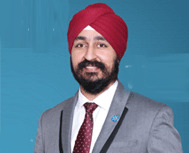 Having tasted initial success in solar, we are soon looking to disrupt energy storage, electric vehicles and smart manufacturing too”, said Puneet Singh Jaggi, the Managing Director of Prescinto. "Prescinto acquires data from remote devices, presents it in neat customizable dashboards and analyses it to give actionable insights"
The growth is visible in Prescinto’s roster of clients from the world’s 3rd largest operator of Solar projects - Solarig in Spain, to large Indian infrastructure groups like GMR and Essel Infrastructure. The sun is shining brightly at Veltoor at 8 am and you can see the spirited technicians scurrying to different parts of the solar plant guided by Prescinto with pinpointed precision. They have a determined look of empowerment by technology in the palm of their hands to move faster, be better and generate more.